NORWAY: Statkraft has reversed its decision not to build a 1GW wind complex in Norway nine months after deeming the project uneconomically viable. 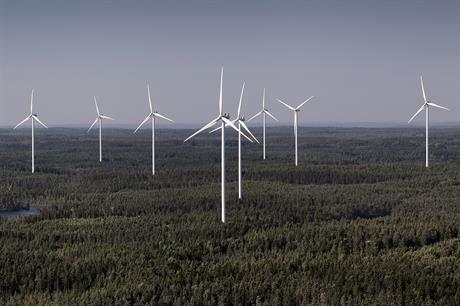 Statkraft will partner local utility TronderEnergi and European investment consortium Nordic Wind Power on a six-project cluster planned to be online in 2020. The six projects will be located on the Fosen peninsula, the island of Hitra and Snillfjord municipality, on the Norwegian coast. Danish manufacturer Vestas has announced it will supply the projects. Statkraft said delivery of 278 Vestas 3.6MW turbines would begin in 2018. The projects will use 248 V117-3.45MW and 30 V112-3.45MW turbines using the manufacturer's power mode to increase output to 3.6MW. Prior to last year's postponement, Vestas had been named the preferred supplier for the six projects with a view to supplying its V117 3.3MW turbine, up-rated to 3.45MW using its new power mode. The investors have formed the Fosen Wind DA joint venture company to develop the projects. Statkraft will hold a 52.1% stake in Fosen Wind; Nordic Wind Power will hold 40%; and TronderEnergi the remaining 7.9%. The Credit Suisse-backed investment consortium, Nordic Wind Power, has acquired stakes of previous joint venture partners NTE and Agder Energi, plus some from TronderEnergi, which were involved when the project was shelved in June 2015. Following the decision last year, Statkraft said it joined with Norwegian grid operator Statnett to review the possibility of the project under new economics and design assumptions. Total investment in the projects will be approximately €1.1bn, Statkraft said. This is less than the estimated €1.25 billion it was preparing to spend on the projects when development was suspended last year. The complex will more than double Norway's current wind capacity, which stands at just over 800MW at the end of 2015, according to Windpower Intelligence, the research and data division of Windpower Monthly. Norwegian Wind Energy Association (NORWEA) CEO Oyvind Isachsen said today's announcement was the "start of a new norwegian energy revolution". NORWEA advisor Andreas Aasheim told Windpower Monthly the project will kick start Norway's wind industry: "This is basically the real beginning. We expect projects totalling between 2GW and 2.5GW - including Fosen - to reach final investment decision in the next six months."